Prior to radiosurgery: painful focus of breast cancer in the right hip with erosion of pelvic bone. Radiosurgery plan targeting the pelvic tumor and sparing the pelvic organs. After completion of radiosurgery: complete resolution of pain and the focus of breast cancer in the right hip, with interval healing of pelvic bone (green arrow). Brown arrow points to normal bladder and pelvic organs. 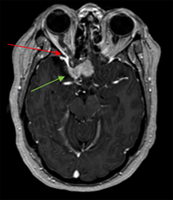 Benign brain tumor (memingioma, green arrows) compressing and affecting optic nerve (visual nerve, red arrow). 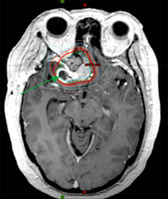 Highly focused stereostatic radiotherapy plan, treating the benign brain tumor (meningioma, green arrows) to high dose while sparing the normal brain, eyes and optic nerves. 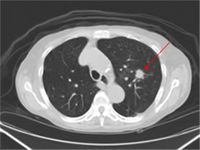 Early stage lung cancer prior to therapy (red arrow). 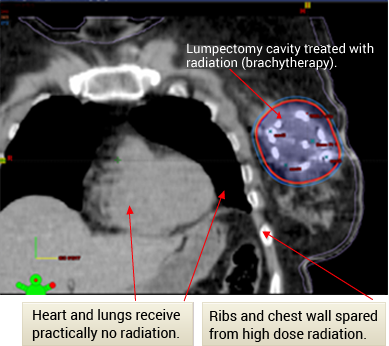 Radiosurgery plan ablating (treating to extremely high focal radiation dose) lung tumor. Early stage lung cancer completely resolved after sterotactic radiotherapy / radiosurgery therapy. "Erlotinib eradicates brain metastases from epidermal growth factor receptor mutant non-small cell lung cancer"
Radiation therapy is generally required for the safe preservation of the breast and optimal cure rates after lumpectomy for breast cancer. Standard radiation therapy in this setting consists of 4-6 weeks of daily therapy to the entire breast. This treatment protocol is unfortunately inconvenient or prohibitive for many working women, those with child care responsibilities, or a large percentage of patients living far from radiation therapy centers or no transportation options. For appropriate patients however, an advanced form of radiotherapy called partial breast irradiationor “brachytherapy (Greek derivation for “close therapy”) can be employed at experienced centers, targeting only the lumpectomy cavity anda “safety margin” of tissue in the breast. Because of the decreased normal tissues and organs exposed to radiation, the overall treatment time is reduced to five days of therapy, vs. 4-6 weeks of daily treatments. After discussion of all options, including deferral of radiation therapy, an advanced partial breast radiation plan was designed for Mrs. Ramirez, allowing her to complete her treatment in a few days as opposed to several weeks. She tolerated the treatment well with no complications and returned to the care of her grandchildren as a full time nanny. Mrs. Arlin is a newly married 35-year old otherwise healthy registered nurse. She had successful surgery and chemotherapy for advanced breast cancer several years ago and has been in full remission. Recently, she had to elect disability due to severe and worsening right hip pain and need to walk with a cane. Scans and biopsy confirmed recurrence of breast cancer in a single focus in the right hip. For appropriate patients with many cancers, including breast cancer, relapse in limited areas can be treated with an aggressive treatment plan with the goal of achieving long-term remission and symptom control. An advanced radiation technique termed radiosurgery was designed for Mrs. Arlin. This allowed completion of her treatment in two weeks, with no side effects and complete resolution of her pain within weeks. Her walking returned to normal. She completed chemotherapy, and returned to full time work as a nurse. Repeat scans showed excellent response of her tumor to radiosurgery, with interval healing of the affected bone and no other sites of disease. A 55-year old otherwise healthy accountant recently began experiencing headaches and right eye vision changes. Following a successful surgery for a meningioma (benign but locally destructive tumor) of the base of skull, scans confirmed residual tumor remaining along the optic nerve (responsible for vision). 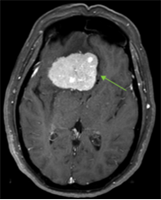 For patients with partial resection of meningioma, post-operative radiation therapy is often required to prevent recurrence and the need for a difficult second surgery and associated risks. Achieving high dose to the tumor in the such close proximity to the nerve of the eye (optic nerve) with standard techniques can pose an undue risk for vision decline or complete vision loss. An advanced radiation technique termed stereotactic radiotherapy was customized for Mr. Fontanelli. This allowed the curative treatment of his tumor, while minimizing radiation dose and side effect risks to the eye, optic nerve, and normal brain. He tolerated therapy well and continued work full time as an accountant during therapy. A 71-year old otherwise healthy active swimmer recently began experiencing dry cough after swims. Scans and biopsy confirmed an isolated early stage lung cancer. Despite her good health, patient did not wish to consider chest surgery. An advanced radiation technique termed stereotactic radiotherapy/radiosurgery was customized for Mrs. King. This allowed the curative treatment of his tumor, while minimizing radiation dose and side effect risks to the heart, esophagus, and lungs. She tolerated therapy well and continued swimming during and after therapy.